We provide a range of compliant pipe repair systems conforming to ASME PCC-2 & ISO 24817 standards. Maxkote works closely with Neptune Research (NRI) providing range of ASME PCC-2, ISO 24817 compliant and none-compliant of pipe repair and wrapping systems. Syntho-Glass® is the originally, patented fiberglass pre-impregnated composite that is activated by salt or freshwater. Packaged in a hermetically sealed foil pouch, it is ready to use and does not require any measuring or mixing. This system, when used with the appropriate primary sealant, enables you to repair and reinforce virtually any diameter pipe in minutes. Syntho-Glass® not only restores a pipe to its original psi rating, but actually can make the repair area stronger than the original pipe, reducing downtime, saving in parts and labor. All ASME PCC-2, ISO 24817 compliant pipe repair systems must to be installed by an accredited Neptune Research applicator. Do not hesitate to contact to discuss your project. Syntho-Glass® is the originally, patented fiberglass pre-impregnated composite that is activated by salt or freshwater. Packaged in a hermetically sealed foil pouch, it is ready to use and does not require any measuring or mixing. This system, when used with the appropriate primary sealant, enables you to repair and reinforce virtually any diameter pipe in minutes. Syntho-Glass® not only restores a pipe to its original psi rating, but actually can make the repair area stronger than the original pipe, reducing downtime, saving in parts and labor. With an initial setting time of only 30 minutes (75°F/24°C), Syntho-Glass® is excellent on copper, steel, SS, PVC, FRP, clay, concrete, rubber, and more. It is safe to use, nontoxic, noncombustible, and odorless. Syntho-Glass is a versatile solution for industries where quick-action pipe repair can be critical. 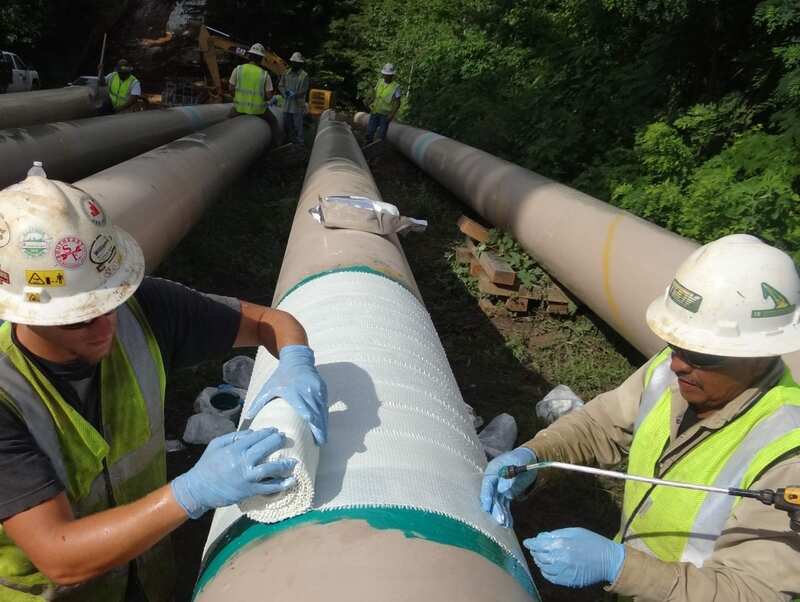 Syntho-Glass® UV has been specifically designed to be an aesthetically pleasing, non yellowing superior wrapping system to provide UV stabilization for pipe coatings, previous composite repairs or anywhere UV degradation is a concern. Syntho-Glass® UV prevents future corrosion and abrasion due to mechanical impact, frost heave, crevice corrosion, galvanic corrosion, and vibration abrasion at soil to air interface, water to air interface and pipe support areas. This system provides exceptional mechanical and impact protection. Syntho-Glass® UV can be used underwater, underground or on above ground pipes and piles. Syntho-Glass® NP Repair System was specifically designed for depressurized pipe repair applications on copper, steel, SS, PVC, FRP, clay, concrete, rubber, and more. By combining the original Syntho-Glass® product, with the extremely chemically resistant Syntho-Steel™, this offers the geometric flexibility to repair joints, tees, couplings, and pinholes. This complete system simplifies the application process and is prepackaged to accommodate pipes up to 10 inches in diameter. Larger repair applications can be engineered to meet your requirements. Syntho-Glass® UP Repair System was specifically designed for under pressure leak repair applications on copper, steel, SS, PVC, FRP, concrete, rubber, and more. By combining the original Syntho-Glass® product, with the extremely chemically resistant Syntho-Steel™ and unique Pressure Sealing Rubber Tape, this offers the geometric flexibility to repair joints, tees, couplings, and pinholes. This complete system simplifies the application process and is prepackaged to accommodate pipes up to 10 inches in diameter. Larger repair applications can be engineered to meet your requirements. Trident-Seal®, live natural gas repair system permanently seals active leaks, up to 60 psi (4 bar) without interruption to service. This kit is pre-packaged to contain enough material to repair a pinhole or threaded fitting on diameters up to 6 inches; larger repairs can be made by utilizing more than one kit. Third party ing for long term pressure retention has been conducted at 90 psi (6 bar). The Trident family of products was specifically designed for the natural gas industry and requires Operator Qualified training.